Spite is an ever-present fact of life among humans — especially in the internet age. But is it purely a human emotion? Many biologists argue that animals feel spite as well — but they disagree about just how spiteful most creatures are. One thing all biologists agree on: Spite has certain rules it must follow. First, spite has to be destructive towards the object of that spite. That's self-evident, but lions that take down wildebeests and male deer who fight each other during mating season aren't being spiteful. Biologists operate on a strict "cut off your nose to spite your face" policy. Spite has to entail a loss for both the giver and the recipient. (This is why birds who kill the eggs or young offspring of their fellow birds are not acting out of spite, even though it might seem that way to us. By killing other chicks, the birds reduce competition for their offspring, and also for themselves. They're essentially just eliminating the competition while it's an easy fight.) Spite survives not because it benefits the giver directly, but because it helps perpetuate the giver's genes. Spite, then, is the kind of destructive behavior that gives the spiteful animal's relatives an advantage. But there is a big schism in biology — the two famous models of spite. There's Wilsonian Spite, thought up by E. O. Wilson. In Wilsonian Spite, animals will behave in spiteful ways to promote the safe growth of their own relatives. Many social insects are good examples of this. Ants and bees show a lot of altruism in their daily life. Most of any colony is made up of workers who will never reproduce, housing, feeding, and caring for a queen because she has some of their genes, and will pass them on. But they're not all sweetness and light. Bees, ants, and wasps, are haplodiploid, meaning that the females are the products of fertilized eggs, and the males are the product of unfertilized eggs. Any given female worker, then, is more related to her sisters than she is to her sisters' male offspring, and more related to her sisters than she is to her brothers. Bees and ants will often kill their brothers, and nephews, in order to shift the colony to more females, and give their sisters a better life with more resources. And then there's a darker version of spite — Hamiltonian Spite. Biologist Bill Hamilton believed that insects might not just kill to help out someone genetically close to them, but specifically target those that are genetically distant. What's the difference? That's what a lot of biologists are trying to work out. Though there are plenty of species to point to in order to demonstrate Wilsonian Spite, it's harder to single out Hamiltonian Spite. The closest anyone can come is by examining the private life of a creature of unparalleled spite — the wasp. 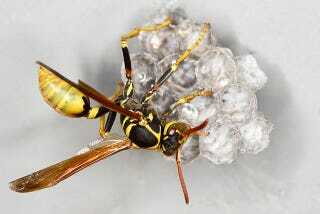 A certain kind of wasp, Copidosoma floridanum, lays its eggs inside a moth egg. The larval wasps proceed to devour the larval moth in a thoroughly unpleasant fashion, but they do it in a particular way. Some wasps become regular larvae, but some become soldier larvae. They kill off other larva - multiple wasps can use the same moth egg — but are sterile, will never breed, and will actually die when the other wasps leave the egg. Things get yet more complicated. For one thing, being haplodiploids, the wasp larva sisters are more closely related to the wasp larva brothers. But there's a twist. Wasp eggs can split into clones, so some of those larvae have the exact same genes. They still kill each other. The soldiers will kill their own clone sisters. They'll just kill their regular sisters more. They'll kill their brothers more than that, and they'll go to town on larvae they aren't related to. Biologists argue that this, right here, is an example of Hamiltonian Spite. The wasp soldiers aren't protecting anyone. They are killing. They simply prefer to kill the larvae that are less related to them. Other biologists think this is simply more Wilsonian Spite. Although the soldiers are sloppy, they are providing more resources for those who share their own genes. What do you think? Exactly how spiteful is nature?